We lay silently in the tent trying not to breathe. The light of the flashlight reflected from the walls of the gorge as a figure made his way through the undergrowth from the road above down into the cove. We were camping without a permit. Surely this was the sign that we had been busted and someone from the local constabulary was coming to haul us away. But, from the iridescent glow of the moonlight, we could see that the man making his way down the beach was clearly alone and clearly not a policeman. Carrying a large bag in each hand, he walked purposely but cautiously towards the gently breaking surf, glancing behind him as he went. “This is a drug drop,” I hissed to PJ through clenched teeth, my heart beating at three times its normal rate. The sound of a boat approaching the bay drew louder. “Oh my God, oh my God, oh my God,” I repeated. This was clearly the point at which the goods were being exchanged. Whether or not this was the case or simply the product of an overactive imagination we shall never know, however, located in a sheer-walled gully, there was only one way up from the beach, and the possibility that something nasty and The Godfather-ish was going down seemed all too plausible. And thus passed one of the most nail-biting 45 minutes of my life. Eventually, attempting to quietly pack up our belongings and escape without being seen by out mysterious visitor, we crept through the trees and then bolted to the safety of the path above. 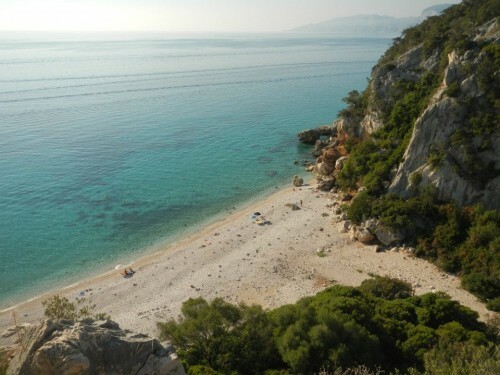 This whole episode took place on the east coast of Sardinia, the second largest island in the Mediterranean From the city of Cagliari in the south to old coastal towns such as Alghero in the north, there is a rich mixture of architecture and culture to be found here. Dorgali is the town to aim for if you are heading up from the capital. and it provides a great jumping off point for both for exploring the national park of the Gulf of Orosei and the famous Cala Ganone. 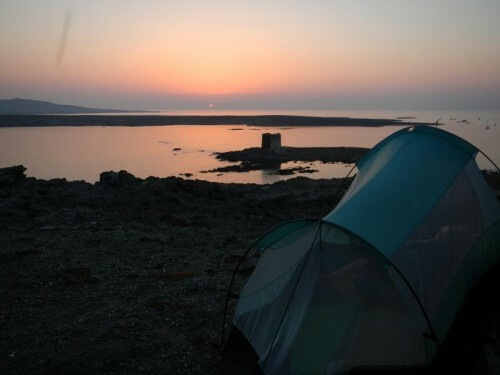 Camping here is strictly prohibited, nevertheless, with a bit of nerve and lot of respect for the near perfection of the natural surroundings, it is doable. The hiking here is spectacular, although depending on what time of year you go, it is necessary to start early in the morning if you are to beat the midsummer heat. It is possible to escape into the wilderness almost everywhere on this underpopulated island, yet it is worth remembering though that his becomes less easy in the more touristy areas of the northwestern tip, especially around one of the island’s most famous beaches, La Pelosa, close to the town of Stintino. It was near here, on the Capo Del Falcone, that we spent some of our most uncomfortable but most dramatic two nights, clinging to the rocky headland as the wind howled around us and ravaged our tent. At times it seemed that we would be blown off into the sea below. It was also here that, following the morning hanging around at the local dock, a couple of young students were persuaded to let us join them on their boat. Together we set off to some of the nearby islands, famous for its abundance of fish (octopus particularly). 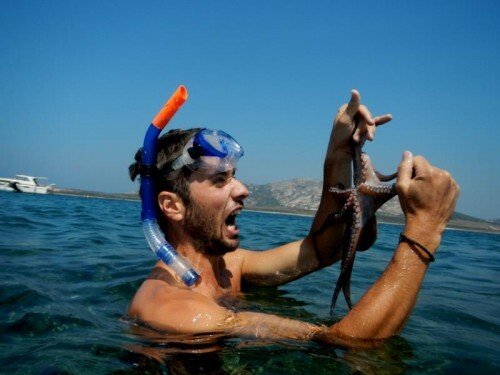 As it transpires, catching an octopus by hand is not something I am keen to ever have to perform, having witnessed the underwater wrestling and stabbing involved. Nevertheless, it was fascinating to watch the man who owned the boat — and who has been doing this since he was a nipper — hunt his prey, coax it from its crevice and then proceed to disembowel the creature as it fought bravely for survival. Gory and a little grizzly, perhaps, but delicious nonetheless. And, as my grandfather always said, if you don’t have the guts to kill it or to see it killed, then don’t fool yourself, you don’t deserve to eat it.